JBRND brings decades of aviation innovation to aircraft window shades. 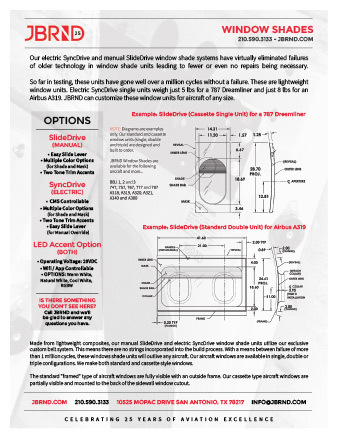 Our electric SyncDrive and manual SlideDrive window shade systems have virtually eliminated failures typical of older window shade technology vastly reducing or eliminating the need for repairs. These Window Shade systems can be customized for any look in any aircraft. Made from lightweight composites, our manual SlideDrive and electric SyncDrive window shade units utilize our exclusive custom belt system. This means there are no strings incorporated into the build process. 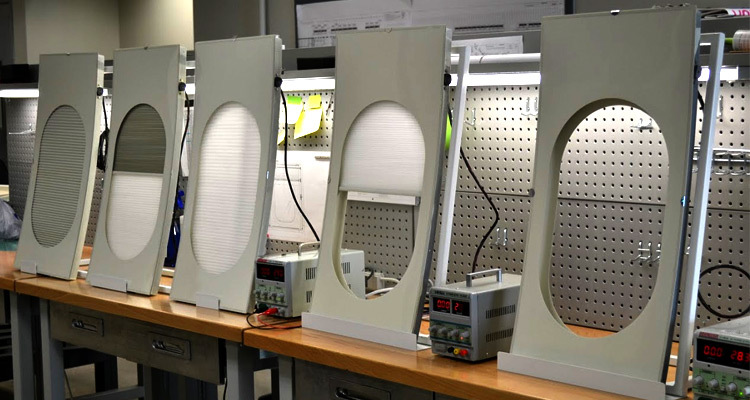 With a means between failure of more than 1 million cycles, these windows shade units will outlive any aircraft. Our aircraft windows are available in single, double or triple configurations. We make both standard and cassette style windows. The standard “framed” aircraft windows are fully visible with an outside frame. Our cassette type aircraft windows are partially visible and mounted to the back of the sidewall window cutout. These are extremely lightweight window units. Electric SyncDrive single units weigh just 5 lbs. for a 787 Dreamliner and just 8 lbs. for an Airbus A319. JBRND can customize these window units for aircraft of any size. In testing, the electric SyncDrive units have gone millions of cycles without a failure which exceeds industry records by far. JBRND’s electric SyncDrive window shade systems come with a unique capacitative touch sensor with standard or illuminated buttons. This system also allows for USB programmed shades for synced shade travel. Our manual SlideDrive units feature a smooth hand-controlled window shade lever above the window. SlideDrive lever controls can be visible or hidden depending on customer preference. JBRND ComboDrive window shades utilize both the SyncDrive and SlideDrive technologies within the same unit. Depending on the preference of the passenger, either method can be used at anytime. Get the JBRND brochure for our window shade products. The brochure is one page, in PDF format, ready for printing. If you are interested in any other JBRND brochures, make sure to visit our Downloads Section, where there are many others available. As always, just get in touch if you have questions. JBRND has completed many window shade programs for all size aircraft. We'll be happy to get you a quote for your headliner kit and more. Get in touch with JBRND today to see what we can do for your project.